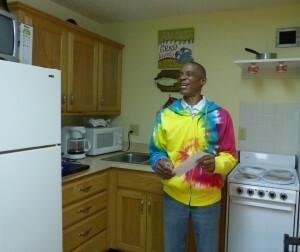 Posada Del Sol Resident, Jose Miranda, enjoys decorating his apartment and socializing with his fellow residents. Westside Housing Organization, Inc. is a private, not-for-profit corporation founded in 1973 by neighborhood residents who wanted the City to improve the physical conditions of their neighborhood and save houses from being torn down for highway construction. Today, Westside Housing Organization is one of the oldest and most respected community development corporations (CDC) in Kansas City, Missouri. Originally rooted on the Westside, Westside Housing Organization has grown to serve other Kansas City metro area neighborhoods over the years, never straying from its focus on the residents and the individuality of each community it serves. With strong partnerships, public and private, and more than 40 years experience, Westside Housing Organization is the go-to affordable housing practitioner in the Kansas City metro area. Ownership and management of safe, quality, affordable multi-family and senior rental homes on the Westside. Find housing now. Home repair grants and construction services that prevent financial crises and promote safe and healthy homes for seniors and families. Learn about home repair services now. Community building & engagement initiatives that support neighbors in advocating for investments and enhancements in their community. Learn about community building initiatives and volunteer opportunities.